Log in to get updates for new posts! Update! See this post for our accepted proposals. Thanks everyone! We're part of two different summer fellowship programs this year, Rails Girls Summer of Code (#RGSoC) and Google Summer of Code (#GSoC) -- both recruit software contributors to work on open source projects. All people with non-binary gender identities or who identify as women (transgender or cisgender) are welcome to apply. Learn more about the program and get involved! They are also seeking coaches to help teams out over the course of the summer -- learn more about coaching here. So, we're asking students from both programs to start posting their proposals for comment, here. Read on! RGSoC's application deadline is the 28th of February. GSoC's is March 27th. Once you've gotten a bit familiar with our project (see our welcome page here), the first step is to look over our ideas page, which you can find here. Our welcoming page will help you understand how we collaborate, and we'll be there to help you take your first step. And try tackling a first-timers-only issue, to get an idea of how to become a contributor! Please ask questions! We're very friendly and we love welcoming new people into our community. Once you've read through some of these ideas and become a bit more familiar with our projects, it's time to post a proposal of your own. You don't need to have a complete or even concrete idea -- share your thoughts early and we'll help you refine your proposal, and help you choose something that's the right difficulty level as well as being something our project really needs. Before or after you post your own draft, read through others' listed below. Your best comments and input may come from other applicants! Lead photo by Ben Raines | braines@al.com. More photos can be found here. This week, something really exciting happened for our partners in Africatown, Alabama. The historic slave ship the Clotilda was reported discovered in Mobile Bay (also see this piece by Ben Raines in Alabama Local News). For those who have been following the posts and projects of MEJAC and Africatown (also see Bridge the Gulf and MEJAC), you will have heard of the Clotilda before. It's known as the "Last Known Slave Ship in U.S."
"Today, this mostly black, low-income community has more than just a unique history as an against-the-odds bolthole of black independence in the Reconstruction south. Residents say they also have a serious industrial pollution and public health problem, and a group of about 1,200 have launched a lawsuit against the owners of a now-shuttered paper plant that was built in 1928 on land that was then owned by A Meaher Jr.
“People born after 1945 seem to be dying before the age of 65,” said Womack, who grew up during the mid-century heydey of the International Paper plant that drew thousands of workers here but also, according to residents, spewed ash across the town." 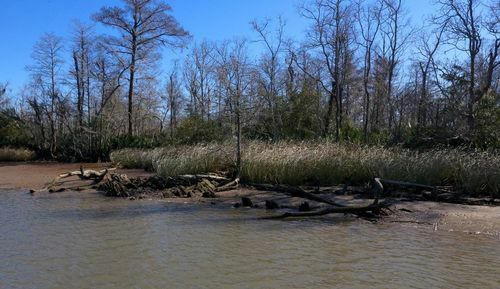 "The news of the Clotilda slave ship discovery is incredible, but so is the resolve of Africatown residents fighting for Environmental Justice today! International Paper may have been a keystone economic driver for Mobile for most of the 20th century, but that does not mean it should have been given immunity from compliance with federal law. No one should be able to poison with impunity. Mobile must deal with its legacy of environmental racism...It's amazing that Africatown’s dioxin/furan contamination lawsuit against International Paper and the formation of CHESS is finally getting attention after a year of work - in a UK media outlet no less. Local media, where are y’all?" For the first time in a while, we've updated MapKnitter.org -- after the release of Leaflet.DistortableImage v0.1.3 -- incorporating new improvements from @justinmanley's Leaflet.toolbar project, as well as some key changes to the image distortion (rubber sheeting) interface. Thanks to @icarito for the help! The biggest change, however, is that, due to supporting Leaflet v1.0, we now support very high zoom levels in MapKnitter -- a long-requested feature we could never get working under older versions of Leaflet. You can now zoom well past the resolution of the reference map, which will just stretch to fit. This means you can do really really high resolution maps -- like gardens, for example. 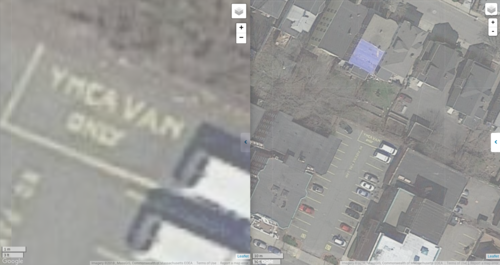 In the example above, the left image shows a single van parking space at a YMCA near where I used to live, while the right image shows the highest zoom level available under the old version of MapKnitter -- the maximum zoom of the reference map. It just stretches, but this is really key for very small mapmaking! Here's another example of a map by @radikaltech that I hope will be able to use this higher-zoom system! Please tell me if it helps! This is a success story for citizen science and for non-profit environmental collaboration with government agencies. Data acquired by MyRWA volunteers and shared with EPA was key to making progress. 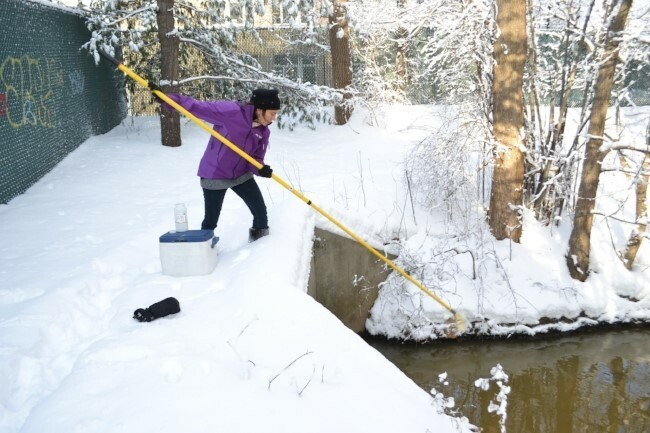 This has been a group effort---from the dozens of volunteer monitors who go out each month to collect samples, to the tireless work of others like Roger Frymire, who spent countless hours finding sources of pollution in the Alewife Brook area. 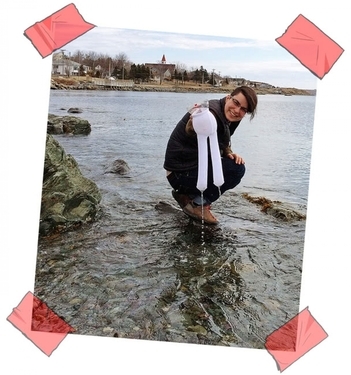 Since 2000, volunteers through the MyRWA's Baseline Monitoring Program have generated water quality data that is shared with state and federal agencies. Each year the EPA in conjunction with MyRWA issues a water quality report card for the Mystic River watershed. 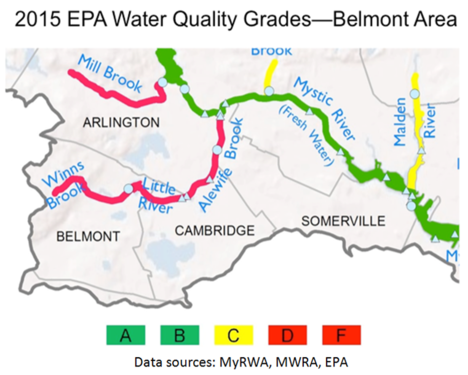 The 2015 water quality report card for the Belmont area tells the story: Alewife Brook earned a D grade with 50% compliance with boating and swimming standards for bacteria; Little River a D- grade at 44% compliance; and Winn's Brook an F grade at 33% compliance. One powerful aspect of the Baseline Monitoring Program is that it is poised to document success as well as problems. As infrastructure repairs are made in Belmont, we fully expect these grades to improve. We look forward to documenting and celebrating water quality improvements to Alewife Brook, Little River, Winn's Brook, Wellington Brook---and the Mystic River itself---over the next five years! Economist Article: "Do-it-yourself science is taking off"
Public Lab and some DIY science friends (Hey @maxliboiron, @eymund, @shannon and @warren !) were recently featured in a piece in The Economist. Check out the article entitled "Do-it-yourself science is taking off." Happy New Year to all, and a special welcome to everyone who has found Public Lab and DIY science projects through The Economist piece! We've been making and distributing Do-It-Yourself spectrometers since 2011, and have been through 4 major kit versions and hundreds of different community contributed modifications, new versions, changes, and more. As a community we've gotten really good at helping people build a spectrometer, but we need to do a huge amount more to support more advanced work, more rigorous and consistent experiments, and more consistent and better data collection. Now we're ready to take this to the next level with a better design that incorporates a vast amount of input and ideas from this huge contributor community. The new 4.0 Desktop Spectrometry Kit is made of... Legos! We're calling it the Lego Spectrometer. You can pre-order it for $50 now in the Public Lab Store, or see the plans at the bottom of this page, in several formats. We'll also be posting build instructions shortly -- and like all Public Lab kits, it's open source hardware -- CERN OHL 1.2. Our mission is to make it easier, cheaper, and more accessible to do environmental monitoring, and to do that as an open source, collaborative community. And of course part of that is cost -- while people build upon our kits with more expensive options and upgrades, we want the basic kit to be extremely affordable. A stable, rigid device is pretty critical for consistent measurements, but many of the ways we tried to solve this were cost prohibitive at the price point we wanted in our kit -- wood frames, lasercutting, 3d printing. There have been some fantastic designs that are rock solid, but Legos allowed us to make a kit that's extremely precise and robust enough to throw in a backpack and not worry that it'll go out of calibration. Past kits have been wonderfully cheap and easy to modify, but they incorporated die cutting and printing with white ink on black paper -- not easy to replicate in the home. This Lego design has almost identical dimensions to our foldable papercraft spectrometers, but you can affordably order parts for just one kit from http://Bricklink.com, or print it on a 3D printer from the models below, and know that the dimensions will be exactly the same. See the assembly instructions for a list of the exact parts and where to source them. 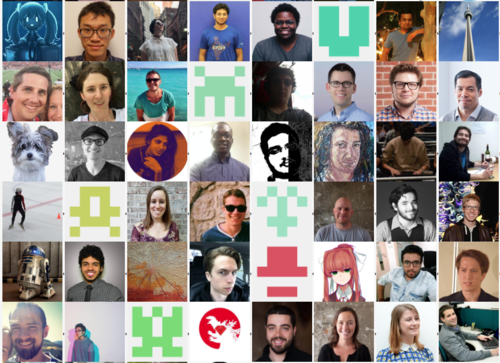 It can be tough in an open source community to get people to work together on a single design, to agree to shared conventions -- everyone wants to try something new and exciting! But if we could get people to modularize and separate out their spectrometers, their sample holders, their light sources and cameras, we could mix and match, and people could make improvements to one piece without breaking compatibility with the rest. Today we're proposing a standard Lego-based interface, which will ensure rigid connections between each part, starting with the connection between the spectrometer body and the sample holder and light source. Below you'll find open source 3D models for the key components, so you can 3D print these connections, but if you already have a device or a sample apparatus, just add these pieces to make it compatible with other Lego Spectrometers. And post your designs! We'd love to hear from you in the comments below. The revolution kicked off by the Raspberry Pi project has made high quality imaging incredibly easy. The Raspberry Pi camera modules are perfect for a DIY spectrometer, with low noise, high sensitivity and small size. But there are still problems to solve there, not least an easy way to connect the whole system to our browser-based uploader at Spectral Workbench! Pitch in and let's iron out some of these issues. But most of all, we're looking for well-documented guides on how to do different tests with these devices. Let's put them to work! Try solving some of these challenges, or add your own!